Beautiful Orchids was founded in 1999 with a mission to educate those who are unfamiliar with the world of orchids, and to offer superior customer service and, above all, quality potted and freshly cut orchids from all over the world. While most orchid Web sites continue to cater to the devotee and collector, we have focused our energies on the beginning orchid enthusiast. The mystique of orchids as delicate and temperamental hothouse divas, requiring specialized knowledge and skill, has given way to the truth that orchids can be maintained and enjoyed in one's home as easily as any other type of houseplant. Beautiful Orchids would like you to believe that the beginner can be just as successful as the connoisseur (LEARN: Orchid 101). Since first introducing our product line to America, we have continued to expand our offerings to include a variety of orchid essentials, elegant vases and porcelain cachepots, and one-of-a-kind potted and freshly cut orchids, as well as exquisite arrangements featuring orchids and other exotic plants and flowers. Beautiful Orchid’s unhesitating devotion to quality and superior service has led to our recent first-place standing in a retail orchid competition conducted by the Wall Street Journal (View article). Beautiful Orchids guarantees that your orchids will arrive in perfect condition. 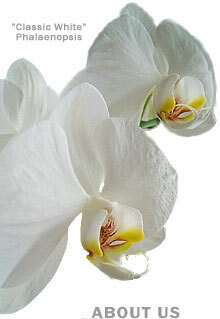 The orchids we ship to you travel in our specially designed, trademarked shipping boxes. Regardless of how perfect the plant or blossom is when it leaves us, if it is not fully protected during shipping it will not arrive at your home in the impeccable condition we, and you, expect it to be in. These orchids are hand-picked by our three full-time orchid specialists, whose job is to visit the best orchid nurseries in California, bringing only top quality plants to our facility. All of our potted orchids are shipped to you while still in bud. This is to ensure that you will enjoy their full blooming stage. Our freshly cut orchids are shipped to you overnight in floral cotton, unarranged. You will be only the second to handle these "sushi grade” orchids, direct from our growers in Thailand, Singapore, Australia and New Zealand. Each stem comes with individual water vials. At Beautiful Orchids, we utilize secure data encryption through SSL (Secure Socket Layers) to ensure that your credit card information is kept confidential. All information transmitted between youthe customerand the BeautifulOrchids.com shopping cart is fully encrypted for your privacy protection.